Back pain, neck pain, Arthritis, Sacroiliitis, Spinal Stenosis, /facetogenic pain, Compression fractures, Myofascial pain syndrome, Fibromyalgia, Phantom limb pain, Post-laminectomy pain syndrome, Migraine headaches, Facial pain, Carpel tunnel syndrome, Sports injuries, Auto accidents. Radiofrequency ablation, Epidural steroid injections, Selective nerve root blocks, Sympathetic blocks, Intercoastal nerve blocks, Peripheral nerve blocks, Peripheral joint injections, Sacroiliac joint injections, Spinal Cord Stimulator, DRG Stimulation, Vertebroplasty/Kyphoplasty, Interspinous Spacer placement, Percutaneous disc decompression, Trigger point injections, Platelet Rich Plasma (PRP) treatment, Vertiflex Superion (Spinal Spacer), Minimally invasive discectomy. 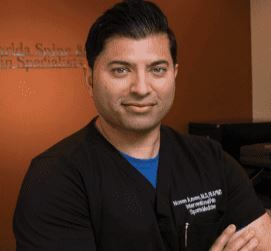 Dr. Nomen Azeem specializes in Interventional Pain and Sports medicine. We are located in Wesley chapel and Riverview FL.